If your child starts to show an interest in their oral health, you’ve got to jump on that opportunity! Usually, parents fight tooth and nail (no pun intended) to get their children to simply brush their teeth. 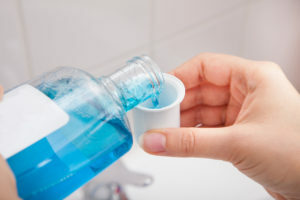 While brushing and flossing remain the best ways to prevent the development of tooth decay and gum disease, older children may take an interest to mouthwash. If they’re wondering about adding mouthwash to their oral hygiene routine, you should be prepared with the knowledge to guide them in the right direction. Your children’s dentist is here to inform you all about mouthwash and when your child should start using it. Here’s what you should consider when deciding whether to let your child use mouthwash as part of his or her oral hygiene routine. We will give it to you straight: younger children should avoid using oral rinses unless under the direct supervision of an adult. Children between the ages of 6 and 12 should only use a mouthwash when in the presence of an adult to make sure the product is being used correctly and not gulped like a minty juice. Children under the age of six should use oral rinses only if their dentist absolutely recommends it. That all depends on your child’s ability to distinguish the difference between swishing/spitting and swallowing the substance. You can also try dipping the toothbrush in the mouthwash and brushing it on the teeth if you’re unsure whether your child is ready or not. What could happen if they swallow too much mouthwash? Mouthwashes for adults contain small amounts of alcohol as well as fluoride for added protection. Younger children who receive excessive exposure to fluoride run the risk of developing of fluorosis, a cosmetically damaging condition. Fluorosis can cause teeth to appear spotted or streaked. Can mouthwash be beneficial to older children? For preteen and teenage children, especially those with braces, mouthwash, and other fluoride mouth rinses offer a great way to help protect their teeth. Traditional braces can make it difficult for kids to adequately clean their teeth using just a toothbrush and floss. This is where mouthwash can help out. Mouthwash helps remove built-up plaque from hard-to-reach areas of the mouth. By taking a comprehensive approach to their home dental hygiene routine, kids who brush, floss and use mouthwash should adequately protect themselves from decay. If you have questions, always ask your dentist. Interceding new things to your children can be tricky. Remember, you’re not alone. If you need help from an expert that works with children every day, feel free to reach out your local children’s dentist. Dr. Michele Moreno is no stranger to little one’s teeth. With two daughters of her own, she’s helped many children reach optimal oral health. This includes cleanings, checkups, and thorough dental education during each visit. Dr. Aiyana Zenobia Anderson is also an expert dentist, practicing for over half a decade. As a mother of a curious son, she’s comfortable helping him and other little patients relax and enjoy taking care of their teeth. She works hard to help patients overcome dental fear, especially if it’s the first time visitng the dentist. If you would like to meet either of our dentists, feel free to give our helpful office team a call.